This year I collected the cranes and the lifeboats drawn. Great stuff, I have stickied the topic for future reference. May I suggest that instead of stickying each thread, we make a single thread for these kinds of sheets called Complete Parts Sheets or something? That way the forum won't get cluttered. Also, and I realize this is a bit selfish, could we have the sheets posted as attachments? That way people like me with lousy connections will be able to see it, and we wont be dependant on the whims of photobucket. I see some very usable parts in there! Great addition to my huge parts sheet! "Rule One, Page One in the Book of War - Do not march onto Moscow"
...hoping to become soon a "respected member"
Great suff. I see some stuff I can use in future merchant ships projects. I prefer my own bow truster's. But for the rest it is awesome. Inspiring stuff - this is the real work that makes the Forum progress. Location: End of a bad sci fi movie. 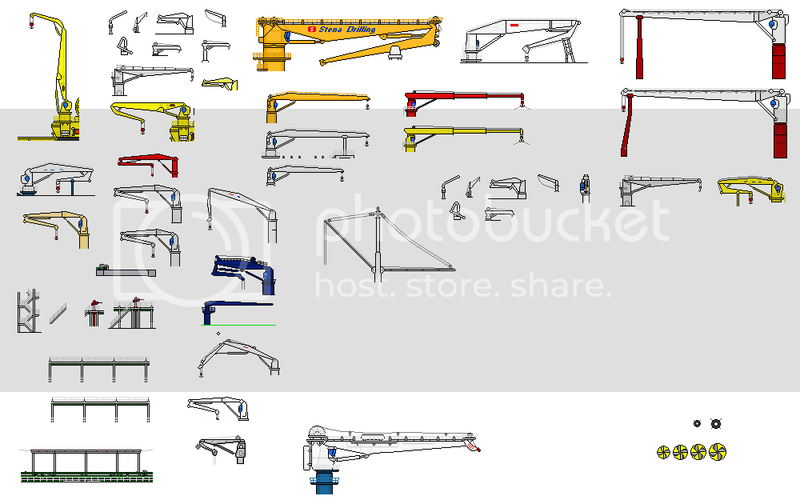 This may be too much to ask but is there a chance the different cranes could be provided with how much they can lift? Or at least into classes like under 5t and over 20t? I'd like to put a crane in a RhN strike craft assault transport that can lift a 10t rigid raider but aren't sure which would be best.